Cook back up, telling us we can get a hands-on. That's iPhone! Tim Cook is back on stage. Cook also seems to be in wrap-up mode. 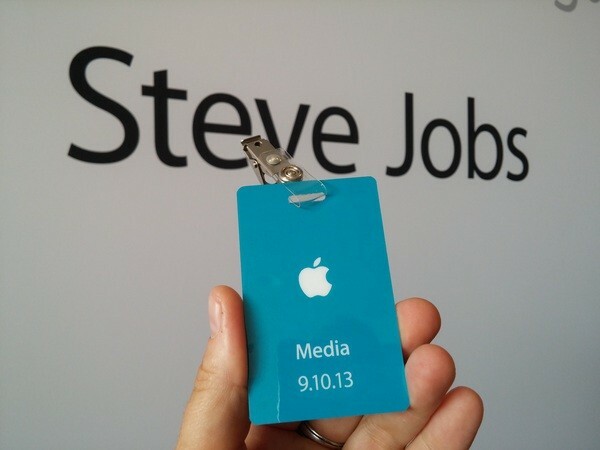 iOS 7, iPhone 5C, and iPhone 5S each get a namecheck. 100 countries and 270 carriers by the end of the year. Friday, Sept 13th: preorder. A week later, Sept 20th, you can purchase both in the US, Australia, Canada, etc. The iPhone 4S is sticking around, at 8GB for free. Prices: Starts at 16GB for $199. 32GB is $299, 64GB is $399. All are on a standard two-year contract, naturally. "It's never available to other software." It's never uploaded to Apple's servers or backed up to iCloud. It uses capacitive touch to read your fingerprint. Now we're getting into the details of how a fingerprint is unique. The home button is sapphire so it won't scratch. A new sensor: the Touch ID Sensor. It's 170 microns thin, senses 500 ppi, scans your sub-epidermal skin layers. Video: Slo-Mo is coming as well. The icon shows it can do 120FPS. It captures HD video at 720p at 120FPS. There's a new burst mode — 10 frames per second. The new flash has two LEDs. One is cool and white, the other is warm and amber. When you take a photo, it actually takes multiple photos and picks the best. The sensor has a 15 percent larger active area. Up to 250 hours of standby. Schiller says it's better than the iPhone 5. 3G talk time: 10 hours. 10 Hours LTE browsing. It can tell apps if you're stationary, walking, driving, etc. A new part, the M7. It works alongside the A7. It's a "motion co-processor." Demo time. Epic Games' Donald Mustard, co-founder of ChAIR entertainment takes the stage. He's talking about Infinity Blade 1 & 2. It runes OpenGL|ES 3.0, like the new Nexus 7.
iOS 7 has been completely reengineered for 64-bit. Apple's apps are also 64-bit. Brand new System-on-a-chip called A7. Apple is really proud of these cases too. Video time. Jony Ive on the screen. 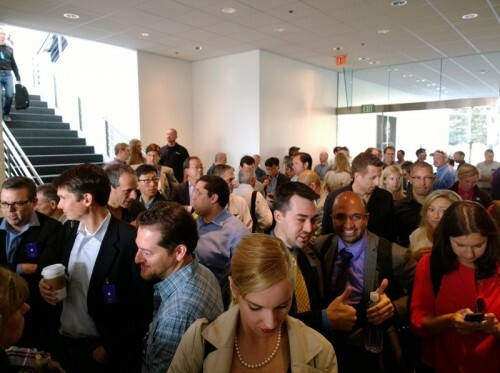 "The distillation of what people love about the iPhone 5." The cases are $29 each. $99 for 16GB, $199 for 32GB. A6 processor, same as the iPhone 5. Apple has also created custom cases with a "soft-feel silicon rubber." The first one is iPhone 5C! "This year, we're going to replace the iPhone 5." They are free with any new iOS device, Cook says. When you set up a new iOS device, you're given a screen to download the iWork apps, iPhoto, and iMovie. Any new iPad, iPhone, or 5th-gen iPod touch. Time to talk about iWork. Cook is back out! Time to switch gears to "other software." It's out on Sept 18th. "There are over 200 features." Briefly talks about AirDrop, iTunes Radio. Boom we're already into the camera's features, with built-in filters and easier modes. The gallery automatically groups photos into "moments" and "related collections." Showing off how Siri can search Tweets — Lady Gaga again. Siri also has Wikipedia, inline web search, and photo search. "iOS 7 is so alive with depth." He's really burning through the feature set here. Talking about Control Center, Notification Center. Craig Federighi takes the stage to talk iOS 7! "Next month, we will ship the 700 millionth iOS device." 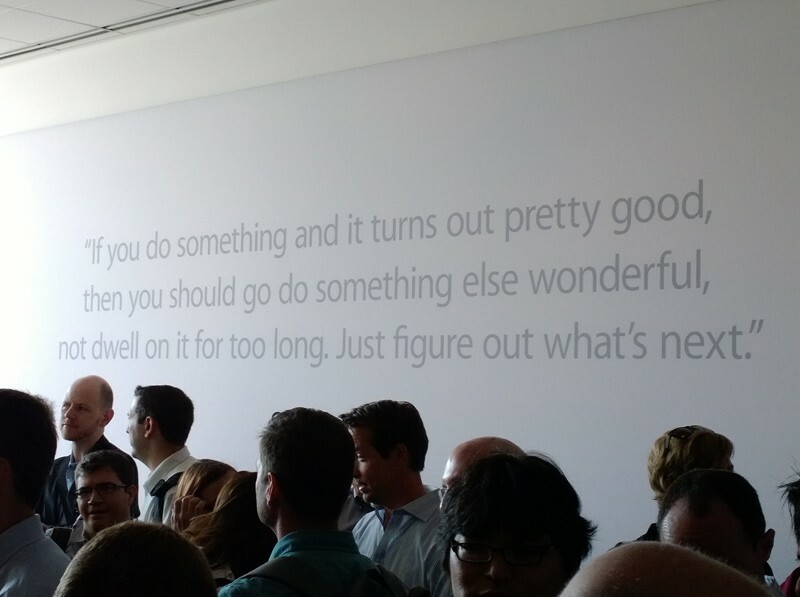 "Also this month, we've been hard at work at completing iOS 7." This weekend it's been replaced with a massive glass-enclosed pavilion. There's glass on three sides and a cantilevered roof. The Stanford, CA store is tiny, but it has served five million customers — 2,000 per day recently. Tim is talking about the iTunes festival, which is in its 5th year. Tim Cook takes the stage after a pregnant pause. Music is playing: Walking in your Footsteps, by Shout Out Louds. Town Hall is incredibly small -- probably only room for 200-300 people in here. 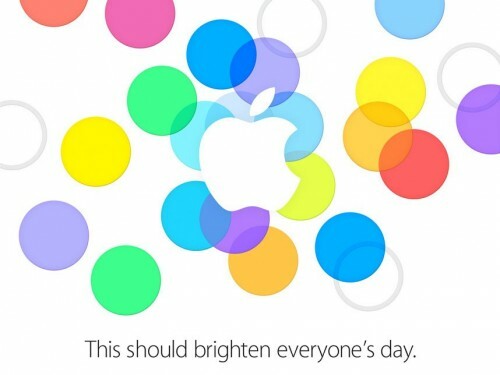 The event begins September 10th at 10:00am PST / 1:00pm EST and takes place at Apple's Town Hall auditorium.